Perfectly portioned, this zesty Flavor Fresh lemon juice will deliver just the right amount of refreshing flavor to your customers' food or drinks. These 4 gram lemon juice packets are ideal for any restaurant, diner, convenience store, cafeteria, or take-out station and offer a quick and easy way to enhance profitable menu items. The 4 gram size is great for offering easy portion control for your customers. This helps prevent them from taking excess and saves you money. I really like the the portion sized packets. We use them for beverages and even baking. They are really convenient and can even take a few on the go. Easy to hand out to customers and save time and money on slicing real lemons. Use in water, tea or any drink you'd like. Great small packages. Great portion control. Portion control saves money. These are great for drinks or to give out to customers. This is the best alternative to real lemons! I couldn't tell the difference between this and other brands. The price is great on Webstaurant. You cannot find it at a better price anywhere else. These Lemon juice packets come in very handy for to-go orders and any catering events that we like to have. Very handy, and the lemon juice taste just like fresh lemon! This item is a score!! This lemon portion pack is so convenient. It is less messy and easy to go for takeouts. It is a great alternative for squeezing fresh lemon specially when I only need a part of it. We like to buy these individual packets. They have been requested by many of our customers, so we decided to look online to find some and we found some at a great price here! The 4 gram lemon juice packets are great for adding a shot of lemon flavor to tea or water. The packets are great for the condiment bar. This lemon juice is high quality and really great if you need a little bit of lemon. The portion size is nice, the packaging is pretty good, and it's nice that you can see the juice on the back side of the package. My customers seem to be very pleased with this product. I didn't want the waste of having fresh lemons available, and this seems to be working just fine. A great portion packet of lemon juice that makes flavoring you tea an easy task when on the road. The lemon juice is perfect and adds a nice twist. These are great for soda and tea. It tastes just like real lemons and the price is more than reasonable. The packets are well made and easy to tear open. Although I prefer fresh lemons, these are nice to have when I want to have hot lemon water and don't have fresh lemons on hand. I can't drink plain water but I also hate sugary crystal light drinks. I know I am picky. But I love lemons and I have always drank my water with lemon juice. This solved my problem of constantly worrying if I had lemons around. I can take these on the go. Perfect to go packets for Tea. Now the customers ask for it when I run out. These are hard to find elsewhere and the price is right. We have a tea urn from Coca-Cola and occasionally customers ask for lemon wedges for the tea. It doesn't happen often enough for us to buy lemons. This was the perfect solution as it is inexpensive and offers an alternative to an actual lemon wedge. I got a recommendation to use this type of lemon for the tea operations, as others ended up throwing out quite a bit of stock with using fresh lemons. Customers seem okay with this option. Shipment was quick from the warehouse, arrived within 2 days via common carrier. These are OK but I prefer the dried lemon packets that they have for drinks like tea. It doesn't quite taste just as fresh as some others. The lemon juice tastes just like 100% real lemon juice. That's a major plus as there are some lemon juices that do not taste like the real thing. My customer was very pleased with the quality of these lemon Juice packets. They are the perfect size for a tea and are priced just right! These were a great addition to my coffee shop! I put them out for customers for their tea. I serve hot and iced tea and while I offer real lemon slices it's nice to have to juice packet options. A great buy. This is such a great product for our tea customers on the go. They can take this with them a lot easier than a lemon wedge. 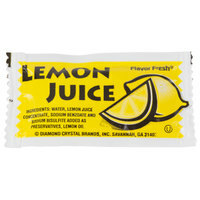 The Lemon Juice - (200) 4 Gram Portion Packets / Case packet worked well with lemonade drink mix. So easy and convenient. Grab some water, put in the drink mix and give that extra kick with the lemon juice. Very refreshing. Great price, quick shipping, right size ! Won't go bad like lemons in the fridge. Easy to throw in a cooler for adult drinks on the go. Will order again ! We love the taste and convenience of using lemon juice packets opposed to fresh lemons. it's more cost efficient for us and the self serve part is a plus for our clients! Our customers seem to like these in their tea. They're very convenient for us and keep the condiment area clean. Webstaurant's price is less than 1/3 of what we were paying elsewhere for the same product, including shipping. Perfect for use with tea. We don't have the capabilities to keep fresh lemon wedges, so these are a great substitute. These packets are the perfect size for single serve use. If you serve tea, you really need these lemon packets to round out your condiments. The packets are cheap, convenient and tasty--tea drinkers will be really impressed for just a few dollars. Very tasteful lemon juice and the packets make it ideal for using with teas. It saves us money for not wasting a lot of lemon juice and the cases are competitively priced to our distributor. This lemon juice is fresh and flavorful, and adds a lemony zest or zing. One packet is more than enough for one person to use. I really enjoy these portion pack lemon juices and so does everyone I have given some to. I gives my brother 2 boxes when I get them and share the rest with friends. I have gone through mine already and have order another batch. So I love them. This is second time we purchase lemon juice packet, webstaurantstore makes the job so easy, save us a lot of time and money to go out buy something for our business. This lemon juice is a great addition to sweet tea. The packs are a very convenient size and they taste really good. My customers ask for it. Can not beat the price! These packets are great! Looks different but tastes just as good as the name brands! Excellent value and sure to please your customers! Great for seafood establishments! Great convenience without the fuss of stocking fresh lemons. This meets the needs of most tea drinkers. Price is reasonable and packaging is clean and clear. Perfect complimentary item for fish, seafood, salads, and certain desserts. Great portion control and cost control. Use them in the bar, also! Priced right and fast delivery!